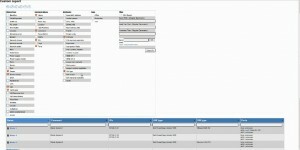 Report extension für RackTables mit Custom Report. Bitte keine anderen Dateien entfernen ! Nun in die Racktables Webseite einloggen und “Reports” aufrufen. Man findet nun vier neue Reiter “Server”, “Virtual machines”, “Switches” und “Custom” im Menü. Bemerkung: Man kann mehrere Spalten gleichzeitig sortieren durch das gedrückthalten von Shift wärend man auf weitere Spalten in der Kopfzeile klickt! Ein einfacher Weg, die ID seines Custom Attributes zu finden ist sich den Quelltext (mit dem Browser) der Attribute in der Konfiguration anzuschauen. Ich habe jede Menge Server mit Namen wie vServer1, vServer2, … vServer11, etc. und ich möchte vServer 10 nach vServer2 in meiner Liste haben. Deswegen habe ich eine eigene Sortierung gebaut. Dieser Customsorter entfernt den Hyperlink (durch den Report hinzugefügt) und alle Textteile vom Servernamen (nur für die Sortierung) und sortiert den Rest nummerisch. Dies ändert die Farbe für alle physikalischen Server (type4) auf rot. Liste alle Cable IDs in einem Rack und hebt Duplikate hervor. Die Datei einfach in das Pluginverzeichnis von Racktables kopieren. Diese Variablen müssen ggf. angepasst werden. Bemerkung: “Common name” in Racktables und “Hostname” in Nagios müssen identisch sein. Dieser Cronjob führt das Skript alle 5 Minuten aus. Funktioniert mit einer normalen Nagios Installation mit NDOUtils oder einer Centreon Installation. Allerdings muss man den Servern in beiden Systemen den selben Namen geben. Is it plugins workable on RackTables 0.20.4? I tried loading them in but the whole server went down.. It should working. I currently can’t test it. I release a new version with small fixes in the end of august. It seems it fails with newest php version because $_POST variable cannot be re-assigned. It seems there is a problem with newset PHP version. The variable $_POST cannot be re-assigned. what is the right configuration of extension.php to work in 20.3? But i’m not sure if it all runs on windows how it should. It fails with newset PHP version (tested on 5.4.4-14) because $_POST[‘name’] is re-assign and this is forbidden by php. the path doesn’t match. You have a different installation structure. But i’m not sure i don’t know exactly your path structure. There i have my “plugins” and “racktables” folders. The “extensions” folder is inside the “racktables” folder. (Same level as the index.php of racktables. I hope this helps you to change the require_once to your setup. I read through the RT install instuctions. It seems like the installation was done a little strange. (Install was not done by me.) Thanks for pointing out the issue. I will look correcting our installation or modifying the paths as you say. Incredible extensions. Any chance you’ll add support to “permalink to results” or something like that on custom reports? I was going to write my own report to list all list all IP addresses in use by any system, but your custom report pretty much does that for me. It would just be nice to be able to bookmark the report for quick access instead of clicking through the interface to get it. Again, incredible work!!! I would donate if I were allowed; my work doesn’t go for that sort of thing. Is it possible to use this via wget? I would like to automate an inventory reporting script, and gathering data from this custom report would be awesome. wget --http-user=admin --http-password=XXXXX -O "vms.csv" "http://localhost/racktables/wwwroot/index.php?page=reports&tab=vm&csv"
Please change the URL to your setup. The extension(v0.3.1) has been working excellent. i would like to modify your server report and i’m having some problems when do i want to modify the server report. How to do modified the server-report.php file??? I wonder if you can help me?? Also, Can I print out the Server or Switches report?? Korean Language (Utf-8) is broken when CSV export. export the report as CSV and open it with libre office or excel and print it. Sure you can add or remove colums in the server report. You have to extend the “$aResult” array with the value you like to add to your report. Don’t forget to extend the CSV and HTML table for the new output values. If you don’t have any experience in PHP just use the custom report instead. Actually, I sometimes used the cusotm report…. However, our co-workers want to use by defined server report. Thus, I want to configure the defined Server Report in order to replace our configuration document for our job. Also, I want to view rack image with add object picture. just try it. Look at the source code and try to add your own fields. Thank you for your advice…. I’ll try to look at the source code and I’ll customizing the report for our job. I think that Racktables extension 0.3.1 is great.. Thank you..You’ve been a great hep already..
I’m sorry to have caused you so much trouble. I still have several questions regarding the customize of the racktables. I’d like to manage the DCIM (Data Center Infrastructure Management) by racktables. If i study the PHP programming, can I afford to do that(example)??? I was wondoring if I could use to method by the Racktables Extension. Thank you for your time and prompt response. The example chart was broken. Could you removed before my comment?? If you inform to me your e-mail, I’ll send the e-mail. I’ll attach an examle file. sorry i don’t understand your specific problem. You can add custom colums to the reports by following the instructions in this article. I think that the extension function has been working great for custom report. However, I want to see a statistical data for system management. I’d like to see with a count of vendor equipment and amount of Locations. If I study the PHP programming, can I be customized the racktables by extension. Thank you so much for your work. These reports are awesome – especially the custom one! I have a question regarding custom reports. I would like to find out how many units a specific Object Type is utilizing. Is this possible? I can’t seem to figure it out. For instance I would like to find out how many units Object Type Servers is using and which are tagged with Tag MMX. Hi. Thanks for your effort on this project. I can not make the plugin to work in version 0.20.8. My plugin dir is inside racktables dir, and the path is correct in the pre-init.php. My question is what else should be inside plugins? Right now I have only extensions.php. Is it right? Put extensions.php inside the plugins folder and the extensions folder inside the wwwroot. figured out how to get this installed. here is the process for racktables 0.20 install for this . We recently add the “Customer Report” plugin into our Racktables 0.20.10. We don’t have output for the Object Type “Rack”. Is this a known issue? And is the a possibility to resolve this? no there is no known issue about this at the moment. I’ll take a look at this problem. If you can mail me some more informations or details it will may help me. What information do you need? FYI: We have several locations with several rows and racks within a row. On selecting the object type “Rack” (or “Row”and/or “Location” btw!) and one/more/all “Common Values”, “Attributes” or “Tags” I’m getting only a “No items found !! !” response. All other types gives me the output. Have you been able to have a look into this? yes i did and i can confirm this bug. Thanks for confirming this. Any ideas when the next release will be published? I have an urgent need for getting the rack info out of Racktables. Any chance you can give me any ideas on how I can export/report all remote connection points on a switch, I have tried but cant find the excat id number I need o use. Look at the “renderObjectPortRowExtended” function in the interface.php file. an than if there is an external connection on this remote object. Switches are Type #8 maybe it helps you to create your own script. Anybody can provide normal instruction for installation plugins to RT 0.20.10 (PHP 5.4.16) ??? i’m running my extension on 0.20.10, too. There shouldn’t be any changes on the installation. extensions.php in the plugin folder which includes the single reports should working. I am having the same problem, however I still cannot get it to work after applying your changes. I am running RT 0.20.11. After some more work I solved my own problem. The problem being that when I follow the instructions to install these plugins, upon logging into Racktables, I get a blank screen. I had to set ownership of user and group for all files to ‘www-data’ (this is the account running my apache daemon). I also found that as long as I don’t have the files “extension.php” and “linkmgmt.php” available, it works. With these files available in the plugin directory, I get a blank screen directly after authenticating. I have tried setting the ownership of the above 2 files to www-data, but that did not solve the problem. Further details: I am running RT 0.20.11 on a TurnkeyLinux LAMP virtual machine. That is the directory where I keep all plugins. I am not symlinking anything. I Thank you very much for a great plugin. I have used it some and made some new reports and everything works fine except for one thing. In all the reports where there are some entries without ip-address that column is sorted fine, however if I have a report where all entries have an ip-address I can not sort on that column. This goes for all reports including the included ones. I tried to fix it by adding an empty character to the ip-address and if I do it is sortable but now as text, i.e in the “wrong” order. I have tried with chrome and explorer but it is the same. Am I the only one affected by this or has anyone else seen the same problem? i created a own tablesorter type for ip-addresses. make sure you use it for the correct column. This is a great plugin! Thanks for working on this. I have been playing with the server reports and manage to add ,ore columns by adding new attributes. However, I wanted to add the Location column – not by adding additional attribute but linking the actual location name against the the row and rack name for each object. Can you help me on this? Also, I wanted to ask if there is a way to bulk upload data on racktables. did you read the examples for adding additional attributes ? Thanks Sebastian, I managed to sort this one out. I ended up adding some lines in the SQL schema. To further improve the report, I wanted to have filtering on the columns, is this possible? Similar to an excel spreadsheet when you apply filters. Regarding my post on August 24: Do you know when the new release will be available with the fix for the issue I’ve mentioned? I thing end of next month. The new version is here and the bug you had reported is fixed. You make my day 🙂 I’ll install the new version asap and will let you know. Just installed 0.3.3 and Looks good! The only issue I see for now, is that Rack Objects don’t show Tags. i’m not sure what you want but have you tried to import “init-sample-racks.sql” from the script folder ? Can you help me with the code in adding custom column in server report? What I want is to add a column to display all the tags for each object. As the tags are not part of the Attributes, I can’t seem to add them the way you described it in your guide. I know the same result can be achieved using your “Custom Report” plugin but I would like to have it on the other reports as well. The tags are loaded with the functions “loadEntityTags” and “getImplicitTags” to the $Result array. This part is not in the server or vm report. Just copy and paste with little mods and it should work for you. I wanted to know can we order display of columns in custom report? But How can I config the setting the Nagios?